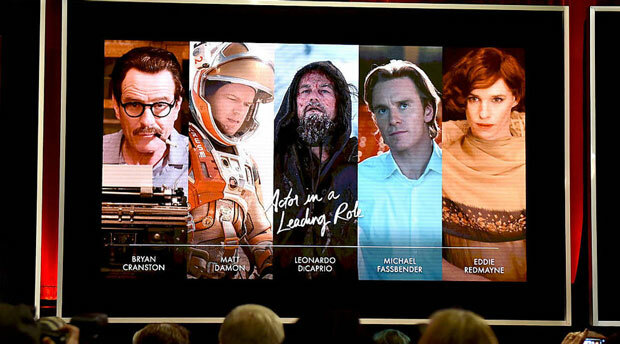 The nominees for best actor as seen on screen at the Academy Awards nominations announcement. All the nominees this year are white men. Last month, #OscarsSoWhite started trending as a conversation on the lack of diversity in the Academy Awards. With the Oscars around the corner, a new study released today suggests that homogeneity is an issue that spans across the entire film and television industry. The study on diversity and entertainment was published by the USC Institute of Diversity and Empowerment at Annenberg. The researchers found that Hollywood is indeed very white, male and straight based on an analysis of the 11,306 speaking roles and 414 works of film or television in the 2014-2015 season. The study looked at major companies including Fox, CBS, NBC, Sony, Disney, Time Warner, Viacom, Amazon, Hulu and Netflix. Gender disparities are clearly highlighted in the study, showing that women made up only 28 percent of speaking roles in film. Television — including series from streamed services — fared better, with women in 40 percent of speaking roles. The study also reported a steep gender gap behind the camera. More than 84 percent of directors were male and 15.2 percent were female. Last year, we reported on the bias affecting women pursuing careers in directing. Our Adriene Hill spoke to Cathy Schulman, president of Women in Film about the gender disparities in the industry. Catherine Hardwicke, director of the critically-acclaimed film “Thirteen” and blockbuster series “Twilight” felt this first hand. Hardwicke said that she tried to meet with studio executives about prospective projects, “and they would literally tell my agent, &apos;oh, we want to hire a man for that job.&apos;"
Behind the camera, the report showed that 87 percent of the 407 directors included in the study were White and 13 percent were from underrepresented racial/ethnic groups. Out of all the directors included in the study, only two of them were Black women — Amma Asante and Ava DuVernay. Only two percent of all speaking characters across the 414 works of film or television were identified as lesbian, gay or bisexual. In thousands of speaking roles assessed, only seven were identified as transgender.